A memorable 2008 FestivALL ended last evening with a great Mountain Stage performance at the Clay Center. One of the best all around performances I can remember in recent past. A storm rolled through Charleston about 15 minutes before the performance and I captured the following photos. Coincidence or not? Well the pot of gold at the end of FestivALL was the "Gold" Mountain Rebels. Jakob Dylan and the Gold Mountain Rebels were excellent as expected as the headliner. The Gold Mountain Rebels had a smooth tight sound that mixed well with Dylan's voice and lyrics. I really enjoyed the performances by singer songwriters, Andy Davis from Nashville and Priscilla Ahn from LA. Great new performers who I was first introduced to at the show and plan to hear more from. Krista Detor and Hayes Carll rounded out the evening with solid performances. For another perspective, check out Roger Lilly's review of the evening at the Charleston Gazette. Sorry for a lack of substantive health care posting the last couple of weeks. The result of being just too busy with client legal matters. This morning I was catching up on my RSS feeds and saw these great photos by Rick Lee (photo to right by Rick of Sonny Landreth) from last nights Blues, Brews & BBQ. Looks like everyone had a great time. We sat on the porch last night after the kids went to bed and caught some of the great music. Today Capitol Street comes alive with artists, performers, etc. Don't miss the fun. Looking forward to watching Jesse & James, Monkeys in the House, Expert Liar Bil Lepp, a variety of music and much more. 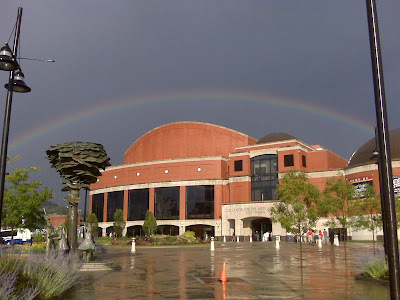 Later in the day Michael Feldman's Whad'ya Know (Feldman visits Power Park) will be in town and tonight University of Charleston plays host to Wine & Jazz. Tomorrow Mountain Stage caps off the weeklong FestivALL wich a great show including Jakob Dylan and the Gold Mountain Rebels, Hayes Carll, Andy Davis, Krista Detor and Priscilla Ahn. My wonderful wife surprised me with tickets - can't wait to see the show. If you Twitter follow all the action aqt @FestivALL. 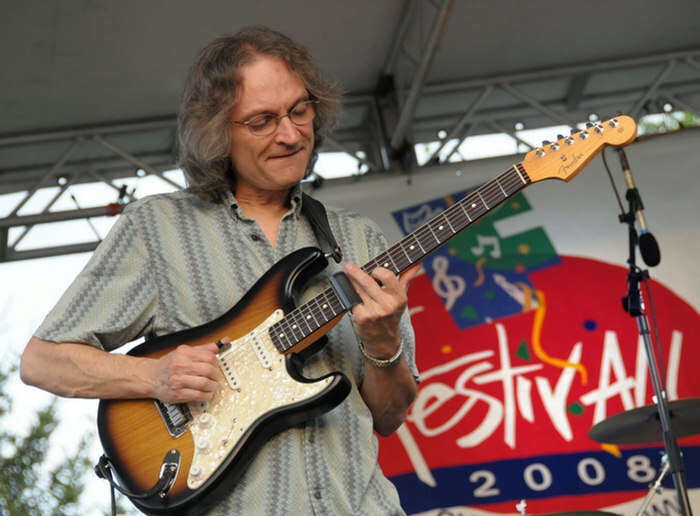 In the words of Larry Groce, Mountain Stage host and FestivALL organizer, "Go out and see some live music [and arts] this weekend." 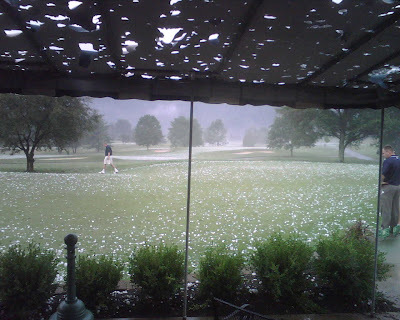 Amazing photos from yesterday's hail storm that swept through the Charleston area. 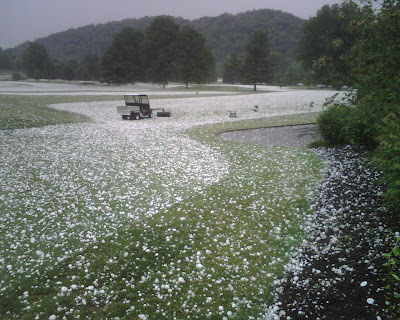 The photos were taken at Edgewood Golf Course in the Sissonville area of Kanawha County by one of my partners, Nate Tawney. 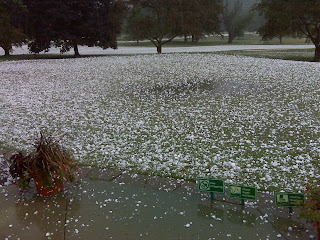 Great shot of the driving range - looks like they haven't picked up balls all year long. 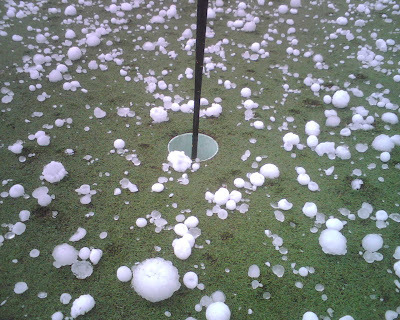 The photo on the green gives you an idea of the size of the hail. 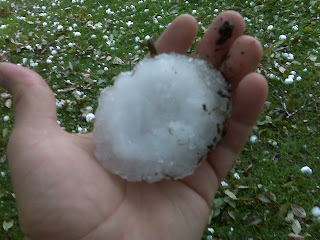 I've heard that the damage to cars in the lot was incredible - broken windshields, etc. One person said, "It looks like someone jumped on my hood with a pogo stick." FestivALL: West Virginia Wiener Dogs Run . . . The Charleston Gazette's front page shot and story of the FestivALL wiener dog races, "and the wiener is . 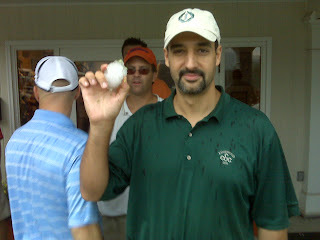 . ."
The photo features one of the winners, "Saugy Bottom Boy" who looks like a real thoroughbred. Our kids along with some of their friends are in the background. Week long FestivALL kicked into high gear yesterday with events throughout Charleston. Downtown was busy with Smoke on the Water and the West Side was packed at the wiener dog races. If you twitter - pick up the latest @festivall. My family and I spent a great day taking in the events. We started out the day dressing up and being photographic models for K.D. Lett's visual arts piece that he is working on as a part of FestivALL. He is taking photos of individuals, groups and families at the Charleston Ballet Building on Virginia Street. Then it was off to the wiener dog races. After that we swung by Ellen's Ice Cream for some "drive by" ice cream and it was off to the West Virginia Cultural Center Theater to catch the amazing work of the Squonk Opera group who performed a custom creation about "Charleston". To celebrate West Virginia Day (June 20), the Health Care Law Blog is excited to be a part of the statewide blogging effort lead by Jason Keeling at aBetterWestVirginia. The idea - collaborate and work together to change the typical stereotypes of West Virginia. Reflect a more accurate perspective of the state, its people, qualities and successes. The state motto, Wild and Wonderful, sits as the centerpiece of all things good about West Virginia. A motto that reflects the states independence, beauty, people and places. These two words bring so much to this West Virginian's imagination. (check the links for the new stereotypes). People that are wildly creative and wonderful to be around. Wonderful landscape that is wildly beautiful and wildly rugged (photo). Artists that design with wild colors and wonderful crafted works of art. Places that are wildly luxurious and others wonderfully quaint. Wildly successful leaders, wonderfully connected health care experts and innovative film directors. Wild water to ride, wild racing and wonderful music for your eers. Workers in wild places powering the world live web. Wonderful traditions and a rich and wonderful history. Finally, a wonderful place to do business with people who are wild about new business. Writing about the positive aspects of West Virginia is something that I have tried doing since starting this blog in 2004. While the main focus is on health care law, over the years, I have taken time out to highlight those events, people and statistics that cast West Virginia in a positive light. Since many first time readers may be visiting as a result of the aBetterWestVirginia blogging project, I thought I would take this chance to highlight some of these past posts. As the saying goes, "what is old, is new." NYT on New Martinsville: Two Americas, Two Restaurants, One Town. Music from the Mountains: Who was Johnnie B. Goode? To learn more about what others are saying to create West Virginia's "new" stereotype check out United, We Blog for a Better West Virginia. Today's Gazette local section covers the Better West Virginia project by West Virginia bloggers to examine and challenge the traditional West Virginia stereotype on West Virginia Day (June 20). Bloggers from around the state will post their view and vision of West Virginia's new stereotype. Sarah Cooper over at the Putnam Scoop asked her regular readers to leave a comments with their impression of West Virginia and its stereotypes. I would be interested to hear similar thoughts from my regular readers. Please leave a comment with your positive or negative stereotype of West Virginia and its people. Yesterday, the West Virginia Health Care Authority Board approved the changes to the Certificate of Need Standards for Cardiac Catheterization. The approved modification will now be delivered to Governor Manchin for review and approval. Eric Eyre of the Charleston Gazette covers the story today in his article, Smaller hospitals get OK to offer heart procedures. The new Standards will not go into effect until approved by the Governor. The current Cardiac Catheterization Standards were last updated and approved by the Governor on May 3, 2007. For more on the process of modifying the standards check out my previous posts. Does Your Doctor Use An EHR? The latest statistics are out regarding the adoption and use of electronic health records (EHRs). The New England Journal of Medicine published the government sponsored survey report. Check out the article in the NY Times, "Most Doctors Aren't Using Electronic Health Records." (full report - Electronic Health Records in Ambulatory Care -- A National Survey of Physicians). The article indicates that only 9% of medical practices with less than 3 physicians have adopted an EHR -- while the percentage increases to 50% for those practices with 50 or more physicians. The comments in the article by one physician seem to confirm a recent conversation with Jack Shaffer, health IT specialist, that EHRs don't necessarily improve physician efficiency. But the new study is based on a large sampling — more than 2,600 doctors across the country — and a detailed survey, making it more definitive than past research, experts say. The results, they say, also show a strong endorsement of electronic health records by doctors who have them, especially for what the report termed “fully functional” records, which include reminders of care guidelines, based on a patient’s age, gender or medical history. “Those numbers are huge and very encouraging,” said Dr. David J. Brailer, the former health information technology coordinator in the Bush administration. Dr. Brailer also pointed to the 54 percent of doctors without electronic health records who said that not finding an electronic health record that met their needs was a “major barrier” to adoption. In short, they are not satisfied with the existing products, which tend to be designed for hospitals — big customers — instead of small practices. AthenaHealth is also mentioned in the article. Over the last several months I have been thinking about whether a web based service as software approach, like AthenaHealth, might be an method to grow the adoption of EHR usage in West Virginia as a part of the West Virginia Health Information Network. The report finding that that most doctors are not satisfied with existing technology should give Dr. Parkinson via Hello Health and other health 2.0 innovators a positive sense of opportunity. As my regular readers know - the Health Care Law Blog gets fishy every year when Charleston's FestivALL rolls around. Sorry for the distraction from health care law but I like to promote my favorite summertime event in Charleston - FestivALL. Just read over at Oncee that the Unknown Hinson will bring his country western psychobilly to Charleston for FestivALL on June 22 at Coonskin Park. If you don't know who he is check out the UNtold Story. Have read about him but never listened to his music until now. Watch him on YouTube. Skip, looks like this might move into my top three 2008 FestivALL events to not miss. By the way, anyone else notice the other art project going on around town? Have you noticed the red/white signs in spanish/english? I was wondering what was up and saw a mention at This is not my blog. Check out more about Amy Williams art project over at Scrabble Crush. Signs of FestivALL are starting to appear. For those of you traveling along the 64/77/79 split don't miss the artwork of Charles"Todd" Thomas whose colorful 10x24 foot creation was chosen as the winner of the art contest sponsored by Allied Artist of West Virginia to help promote this year's FestivALL. The artwork is being displayed on the Mountaineer Expedite Building (formerly Purity Baking Building). Allied Artists along with Tamarack will also be sponsoring the FestivAll Capitol Street Art Fair. It's free for the public and set for 10 a.m. to 7 p.m. June 28 and 10 a.m. to 5 p.m. June 29. More than 100 spaces are set aside for artists to show and sell their works in a variety of media. Visiting Capital Street for FestivALL is a must. 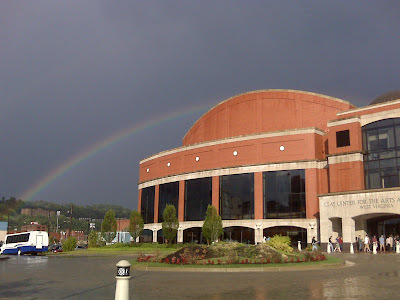 There is a variety of activities for adults and kids with constant performers on a variety of stages and a street fair in front of the Kanawha County library. Dr. Parkinson is speaking at HIMSS Summit today. Check out his slides for the presentation. Great ideas on how physician services and health care needs to change. Looks like a great agenda. Look forward to seeing reactions and discussion coming out of the summit. Excellent work by Oncee and The West Virginia Optimist the brainchildren of 304Blogs (named after the West Virginia area code). A place to check out all the WVloggers (think WV bloggers). Thanks for adding the Health Care Law Blog front and center. 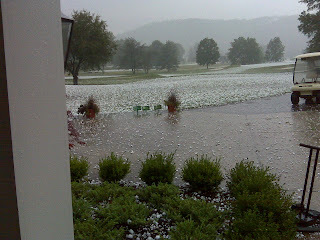 Great place to visit and see what West Virginia bloggers are doing. Tips on how to use or if you want your blog to be added. Today the Office of the National Coordinator for Health Information Technology (ONC) released "The ONC-Coordinated Federal Health Information Technology Strategic Plan: 2008-2012". Find more information here, including a synopsis of the full report. The plan is meant to serve as a guide to coordinate the federal government's health IT efforts to achieve a nationwide implementation of an interoperable health information infrastructure. Looking toward the future, we can envision a health care system that is centered on each and every individual patient. Clinicians will have at their fingertips all of the information needed to provide the best care; individuals will have access to this and other information that can help them engage and insert their values in the decision-making process about their health and care; and, secure and authorized access to health data will provide new ways that biomedical research and public health can improve individual health, and the health of communities and the Nation. Patient-focused Health Care: Enable the transformation to higher quality, more cost-efficient, patient-focused health care through electronic health information access and use by care providers, and by patients and their designees. Population Health: Enable the appropriate, authorized, and timely access and use of electronic health information to benefit public health, biomedical research, quality improvement, and emergency preparedness. Each goal has four objectives and the themes of privacy and security, interoperability, adoption, and collaborative governance recur across the goals, but they apply in very different ways to health care and population health. I've only had a chance to scan the synopsis and the 115 page full report but should make for interesting reading for anyone involved in the ongoing evolution of our health care system and the impact that health technology is having on the industry.